When the Bloomington City Council first convened in 1953, councilmembers were elected "at large." Each councilmember was elected to represent the entire city's residents and interests. At that time, the Council had 5 members including the Mayor, who was (and still is) an at-large Councilmember. The City Charter, adopted in 1960, called for an increase in the number of councilmembers from 5 to 7. A 7-member council was first seated in 1962. 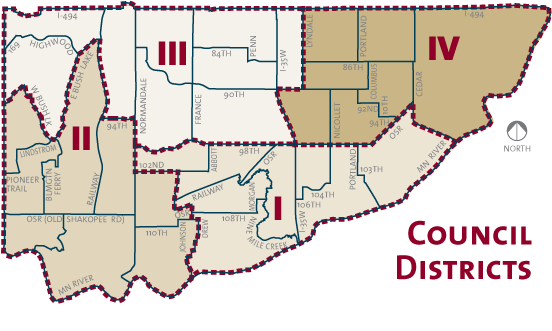 In 1976, 4 of the 6 at-large positions were assigned to represent specific quadrants of the city (District I to the SE, District II to the SW, District III to the NW, and District IV to the NE). The remaining 2 positions continued to represent the interests of the city at large. In 1976 and 1977, during the transition to this new configuration, the council had 8 members (1 Mayor, 4 district councilmembers, and 3 at-large councilmembers). The third at-large position was eliminated in 1978, and the resulting structure has remained unchanged. Changes in personnel are noted in bold type. Bloomington became a village on May 11, 1953. McCutchan resigned May 1956. Herman Kossow appointed May 7, 1956. Donaghue resigned May 2, 1959. Maistrovich appointed June 5, 1959. Bloomington adopted City Charter November 8, 1960. Malone appointed January 2, 1962. 1962 was the first year with 7 councilmembers, an increase mandated in the City Charter (approved November 8, 1960). At-Large: William L. Crain, Jr.
At-Large: William V. Belanger, Jr.
Hoffman resigned April 5, 1971. Allen appointed April 19, 1971. Pleasant resigned November 15, 1972. Darr appointed January 2, 1973. There were 8 councilmembers (including the Mayor) in 1976 – 1977, during the transition from all at-large positions to a mix of district and at-large positions. There were 8 councilmembers (including the Mayor) in 1976 – 1977, during the transition from all at-large positions to a mix of district and at-large positions. Mayor Benedict resigned January 3, 1977. Lindau appointed January 10, 1977. Houle appointed January 8, 1990. Mahon resigned December 31, 1992. Krueger appointed March 29, 1993. Wilcox elected September 14, 1993. Mayor Peterson resigned January 3, 1995. Houle appointed Mayor January 3, 1995 (surrendering her At-Large position). Winstead appointed to the At-Large position February 21, 1995. Lenczewski resigned January 3, 1999. Spies appointed February 1, 1999. Bianchi resigned August 14, 2000. Abrams appointed September 25, 2000. Elkins resigned March 7, 2011. Tim Busse appointed April 18, 2011. Busse ran for and was elected to the at-large seat, creating an opening in the District 3 seat. Abrams resigned June 6, 2016. Vlaisavljevich appointed in July. Carlson resigned December 31, 2016. Spencer appointed February 16, 2017. Nelson elected November 7, 2017, and sworn in November 20.